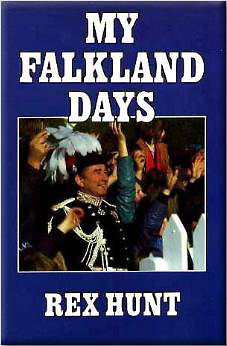 Little of Rex Hunt's book has much to do with the Colonial Service or diplomatic life, but if there is a desire to understand the Falklands pre '82, much of the background to the conflict and the immediate effect on life post '82, then I suggest that the time taken to read My Falkland Days would be worthwhile. I should point out that although our Governors were usually from the Colonial Service the Islands were controlled hy the Foreign Office. It was the belief of Islanders that the said department wanted this obstacle to good relations with South America out of the way. In 1968 George Brown did a deal with the Argentine and sent Lord Chalfont here to sell it to the Islanders but thanks to the support of Parliament that was knocked on the head. Although the Sovereignty Dispute was put on the back burner for a short while, it was always there. This added to the uncertainty of the Islanders, and by the time Sir Rex Hunt arrived we had Nicolas Ridley trying to sell us Leaseback. Rex Hunt in the early part of his book paints a picture of the Islands, the way of fife and the sort of people who lived there. The Islands at that time were in decline, the only industry was sheep ranching on a large scale and the major income was the taxation of the sheep farming companies. As there was no budgetary aid the treasury income swung back and forward with the world wool market. Sir Rex points out that the Administration was small and the infrastructure, like everything else, was in need of expenditure we did not have. In addition to the lack of money he brings out the uncertainty engendered by the Argentine claim. It is interesting to note the feeling Sir Rex had of being the piggy in the middle. He needed to put forward the policy of the Foreign Office yet seeing the reaction of the Islanders and their Councillors. At this time the Legislative Council consisted of the Financial Secretary, the Chief Secretary and six elected members, while Executive Council had the two ex officio officers, two independent members nominated by the governor and two members elected by their fellows from the Legislature. It was to these Councils, directly opposed to any change to the Sovereignty status, that the Governor had to put forward the British Government's wishes. It is also interesting to note that the Governor was not always fully informed on the British Government's policy with regard to the FaMands. I found this period of late '81 and early '82 the most interesting part of the book as it brings together material not covered in other works except various HMG reports which appeared after the conflict. The post conflict section is rather a catalogue of visitors, ships and people. It does bring out both the conflict and co-operation between the administration and the military. Sir Rex also covers the problems of the 31 million pound rehabilitation fund, the control of expenditure by ODA and the Foreign Office, and the fact that the two could not work together. The author touches on the Boarding House construction for Camp children (it was never occupied and was eventually demolished) and the wrangling over the rebuilding of the hospital, which had been so badly damaged by fire. As a result of Lord Shackleton's second report Sir Rex got the Attorney-General he so much wanted and a much-strengthened Administration. During this time of change we were also negotiating with the British Government a new Constimtion, under which the two ex officio members would be members of both Councils but would be non-voting. The number of councillors in the Legislature would be increased to eight and of these eight three would sit on Executive Council. As a local I must admit that I skipped some sections with regard to visits to Settlements and ships but I enjoyed the book.